The Firehouse: Holy People, The Cradle, Minerals. 8 p.m.
Little Italy’s: Jazz Jam. 8 p.m. The Nick: Open Mic. 8 p.m.
Brennan’s: Blues Jam with The Regals. 10 p.m.
Little Italy’s: Open Jam. 9 p.m. The Nick: Pistol Hill, MarDe Brooks, Ritch Henderson. 10 p.m.
Tin Roof: Hardy. 7:30 p.m.
Zydeco: Tyler Rich, Jordan Fletcher. 7 p.m. The Nick: Rickshaw Billie’s Burger Patrol, Headwires, House Fight. 10 p.m.
WorkPlay: The Goods. 6 p.m.
Birmingham District Brewing: Hannah McFarland. 7 p.m.
Little Italy’s: Ham Bagby. 8 p.m.
Mom’s Basement: Wild Moccasins, GEMS. 7 p.m. The Nick: Aaron Hudgins Music, Anna McElroy. 10 p.m.
BenJammin: Chris K. Davidson. 7 p.m.
Champy’s: Automatic Slim. 7 p.m.
Desert Island Supply Co: Rociety of Broken Soul, Rachel Hébert. 7:30 p.m. The Firehouse: Long Bony Arms, Headcase. 8 p.m.
Little Italy’s: Jason Grubbs. 8 p.m. The Loft Show: Riley Moore, Rusty Clanton, De Joie. 7 p.m.
Mom’s Basement: Jeff the Brotherhood, The Aphids. 8 p.m. The Nick: Soul Desert, mmhmm, Results of Adults. 10 p.m.
Saturn: Funk You, The Talismen. 9 p.m.
Tin Roof: Jay Taylor. 10:30 p.m.
WorkPlay: John Craigie, Eric Watters. 8 p.m.
Zydeco: Bailey Ingle. 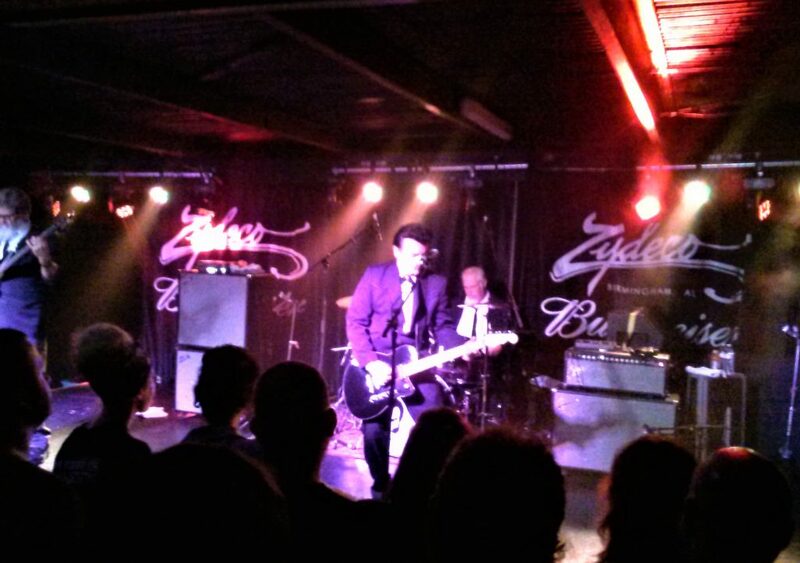 9 p.m.
Zydeco: Unknown Hinson. 9:30 p.m.
Avondale Brewing: The Dexateens, Dead Fingers, Shaheed & DJ Supreme, Holiday Gunfire, Fist City Country Show, Results of Adults. 3 p.m.
Daniel Day Gallery: Steve Norris. 1 p.m.
Ghost Train: Bloodkin. 3 p.m.
Gip’s Place: Sam Frazier. 8 p.m.
Little Italy’s: Reed. 8 p.m.
Mom’s Basement: Rose Ette, Bright Knives, HelioHeart. 9 p.m. The Nick: Eter4, Along time ago go. 10 p.m.
Seasick Records: John Paul White. 1 p.m. Trim Tab: In Snow, Startle the Heavens, Kinzie. 7 p.m.
WorkPlay: Parker Millsap. 8 p.m.
Zydeco: Bluetech, Moglee, John Bruce. 9:30 p.m. The Firehouse: Pink Mexico. 7 p.m. The Nick: The Dirty Lungs, illiterates, Radiator King, Alexa Rankin. 10 p.m.
Saturn: Strand Of Oaks with Tyler Ramsey, Tyler Ramsey. 8 p.m.
Tin Roof: Jacob Brock. 2 p.m.
Is there another gig here in Birmingham that we should put on this week’s calendar? Send the details to tom@magiccitybands.com. Be sure to include the venue, day, time, and the names of all the other acts playing. Pictured: Unknown Hinson. You can see him return to Zydeco this Friday.